Here’s a basic recipe that I used last night for dinner. It’s a very classic “Using the Force” sort of recipe, where I started with a single ingredient for dinner and then started pulling things from the fridge/cabinet, blending them until the sauce tasted the way I wanted. I actually went to a few recipe sites, but wasn’t finding the sort of ingredient list I could pull together, so I “Used The Force”. If this term is new to you, please check out my explanation at the very beginning of this blog (almost <gasp> two years ago). I started out with two packets of Salmon for our dinner. Seriously, these are 4-oz packets of frozen salmon that I picked up on a “super deal” at the local grocery store… awesome for a quick meal and easy to add/subtract as your guest count changes. I let the salmon thaw in the fridge during the day so it was easier to handle when dinner time rolled around. NOTE: It might have thawed faster if I had taken it out of the packaging, but I didn’t want to worry about the mess. Looking in my fridge, I found four small Yukon Gold Potatoes and a head of broccoli. For two of us. this seemed like the perfect amount to roast for dinner, as long as the potato pieces were thin enough and the broccoli was sliced into bite-sized pieces. Again, these are items that you could easily increase to serve more people if necessary. NOTE: If you end up doubling this recipe, I would separate the vegetables from the salmon and roast them in different pans so that you can control the cooking times of each as needed. You can also substitute your favorite vegetables for this dish… just be aware of size and cooking times of whatever you choose. Once I had my main ingredients picked, I needed to create a sauce…and here’s where The Force came into play. All-in-all, I used the following ingredients: Hoisin sauce, dijon mustard, white wine (I used a Chardonnay I had in the fridge), balsamic vinegar, soy sauce, and honey. Using a medium bowl, I spooned some hoisin (asian BBQ sauce) into the bowl, poured in some wine. and squirted in some dijon mustard. These were not equal measures, but I went light on everything so I could add more if needed. I like using hoisin because it’s got a bit of a kick and it thickens up things nicely. I then added a few splashes of balsamic vinegar, a generous portion of soy sauce, and sweetened everything up with a bit of honey. After whisking everything together, I tasted the result and added another bit of honey so the sauce didn’t have too much bite. I chose to make this recipe on one sheet pan, so I covered a baking sheet with foil and sprayed it with cooking spray so the sweet/sticky sauce wouldn’t be difficult to handle after cooking. I sliced each potato in half, length-wise, and sliced each half into very thin half-rounds that would cook fairly quickly before layering them on the baking sheet. I then cut the broccoli into thin slivers, cutting small stalks in half as needed, and layered them on top of the potato thins. I decided to top the veggies with a bit of sauce before adding the salmon because I wanted to make sure I got most of the veggies touched with the sauce… not necessarily coated, but a little bit would go a long way with this flavor. Once I had spooned sauce on the veggies, I laid the salmon fillets on top and spooned sauce over them as well, using up all the sauce. It smelled rich and flavorful, even as it hit the oven, which was my intent… I love when the house smells like something delicious when we’re getting ready for dinner! Dinner cooked for 30 minutes in a 375-degree preheated oven and was really tasty. 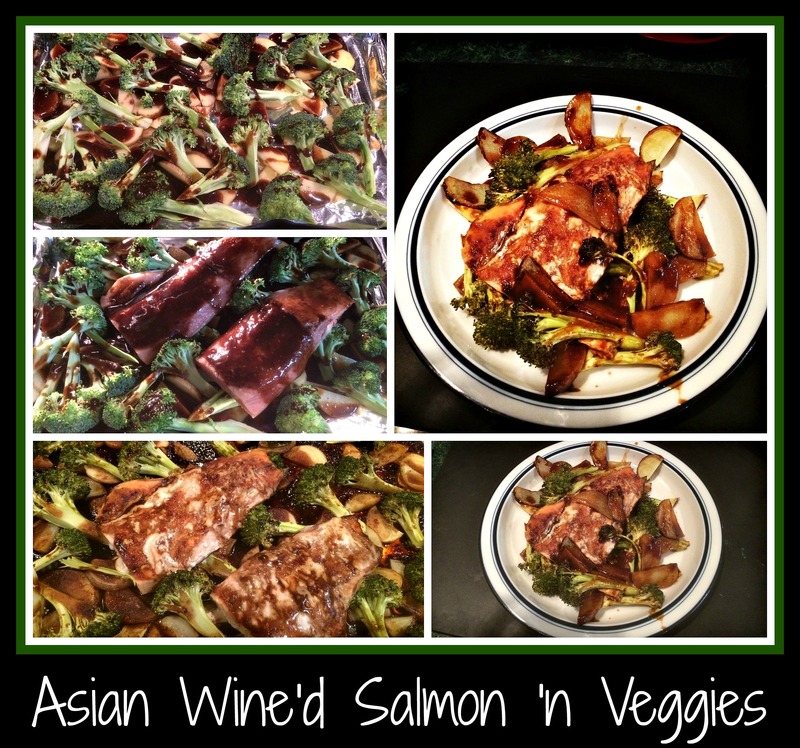 The potato thins were cooked, the broccoli was crisp-tender, and the salmon was delicious. I reheated rolls to have along side this meal, but it really wasn’t necessary. Just follow your instincts and see what your family prefers. Remember, this is a recipe that you can change up in a million ways to suit your family’s individual tastes so have fun with it. We thought it was a hit! Yes, this is a strange way to use wine, but I was curious. 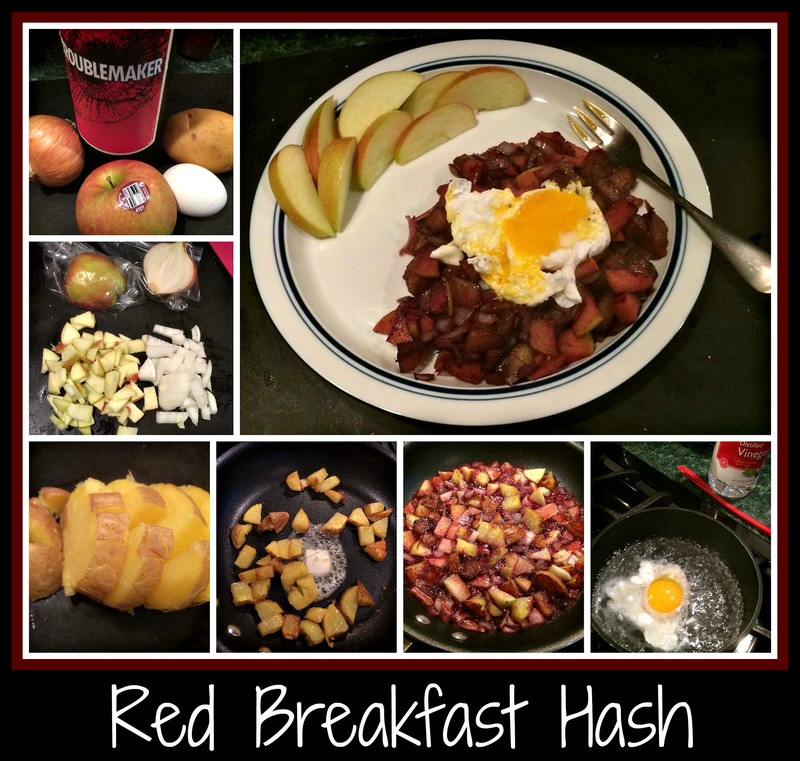 I had time on my hands, two potatoes, and some red wine… so what else was I to do, but to try out this recipe? I started with two potatoes, a small amount of crushed garlic, about a cup of James River Cellars Hanover Red wine, and some herbs de provence. I diced the potatoes into even cubes, added them along with the garlic and the herbs into a small saucepan, and then poured in the wine to almost cover the potatoes. 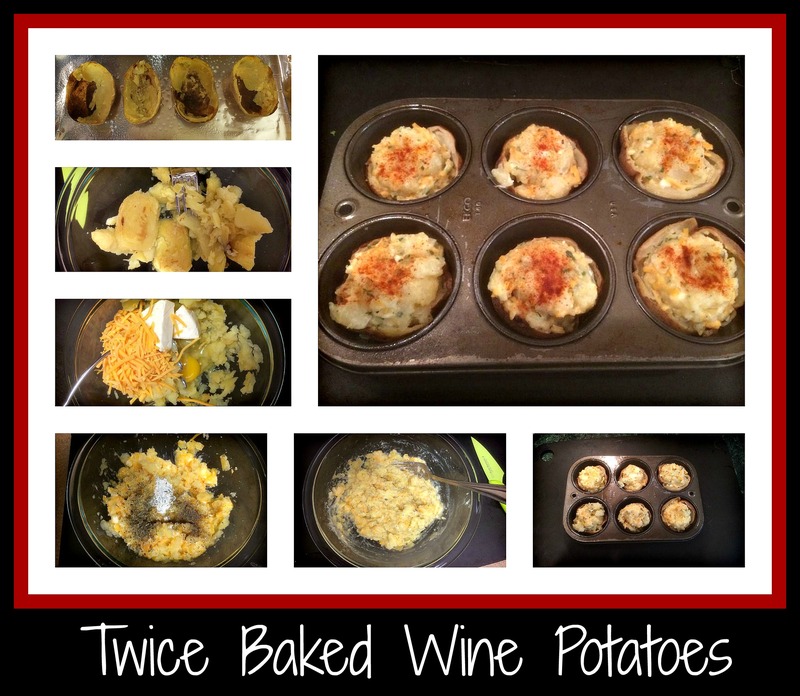 I cooked the potatoes in the wine until much of the wine had been absorbed. NOTE: Next time, I think I’ll add a small amount of chicken stock along with the wine… the potatoes didn’t cook quite as much as I would have liked before the wine was absorbed. Once the potatoes were ready, I mashed them until they were fairly smooth before adding a touch of margarine and some milk to turn this into a rather unique side dish. NOTE: I wasn’t thrilled with the final purple color – next time, I think I’ll smash the potatoes and then just add a little butter, to allow the red and white colors to show through. 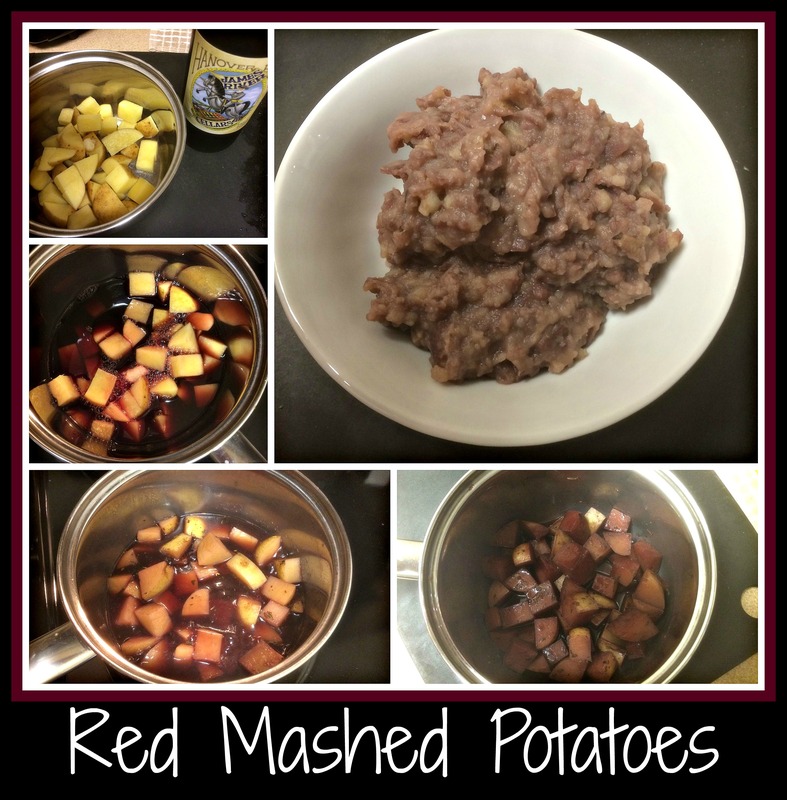 When the potatoes were totally mashed, they turned purple…. before that, they were really pretty. I might even just toss the cooked potatoes with a small bit of olive oil and roast a touch so the colors don’t change. Sometimes we all have “less than favorite” final results when trying out a recipe. I wanted to post this so you know that we’re all in that same boat. I have the occasional flop, just like everyone else… the idea is to learn from any mistakes and keep trying. Enjoy the journey and keep cooking!